Paying attention starts to come easier for distractible Sam once he learns to harness his powerful brain. Eight-year-old Sam has an awesome imagination. He makes up super stories about the deepest seas, outer space, knights and castles—he has all kinds of good ideas! But Sam often has trouble focusing on schoolwork and things grown-ups ask him to do. Sometimes it seems like all he hears is, “Focus, Sam!” and, “Pay attention!” The doctor says Sam is lucky: He has a very powerful brain. But he does need some help focusing. She gives Sam and his dad lots of strategies to try, like staying organized, eating better food, and asking for help when he needs it. Sam’s favorite strategy? Make time to exercise his imagination! 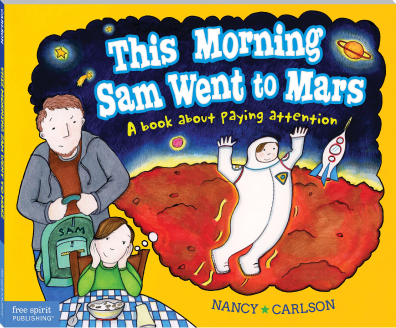 2 Responses to "This Morning Sam Went to Mars"
When will your most recent book, This Morning Sam Went to Mars, be available for purchase? Will it come out in both hardcover/soft cover at the same time? The new book is both in paper and hardcover. I am signing this week at The Red Balloon Bookshop in St paul MN.